When Parramatta Stadium was pulled down so the new Western Sydney Stadium could be built, the residents were unhappy to learn that the much loved Parramatta War Memorial Pool had to be demolished in the process. 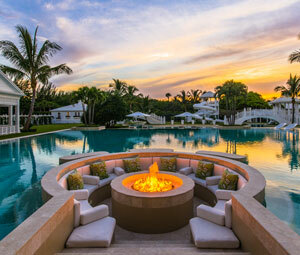 But they were mollified by the promise to build a new, modern swimming pool in its place. However, while the new stadium construction is progressing apace, squabbling over funding between the state government and the council has left the pool in limbo. 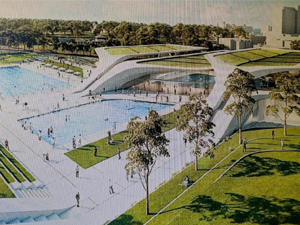 The City of Parramatta Council says their aim is to deliver the contemporary year-round aquatic leisure centre their research indicates is demanded by their ratepayers, and that according to the relevant NSW Parliamentary Committee, the State government should pay for it. Now the Minister for Sport, Stuart Ayres, says the State will build it but won’t spend any more than $30 million. Parramatta Mayor, Andrew Wilson has said that is insufficient to deliver a like-for-like pool. The council was unhappy with the four designs submitted from the international design competition as each surpassed the $75.2 million budget – some costing as much as $90 million. The designs have been leaked to the Daily Telegraph [paywall], showing futuristic plans that have some residents excited, while others are happy with a basic pool but want it expedited. 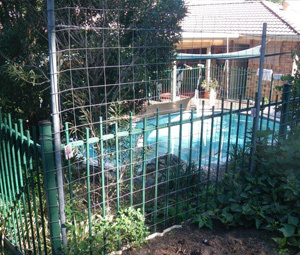 Local residents, frustrated at the slow progress of the pool, have started a Save Parramatta Pool Facebook page. In October, counsellors split along party lines and voted to halt the progress on the pool. Minister Ayres told the Sydney Morning Herald on November 13 that he had had enough. 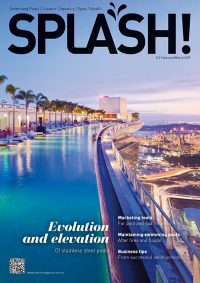 A spokesperson from City of Parramatta Council said that the council has been working hard to deliver a contemporary year-round aquatic leisure centre on the basis of extensive community and stakeholder consultation along with market research, industry insights, and feasibility studies. “The selected site for the new centre (the Mays Hill Precinct within Parramatta Park) has presented challenging site conditions and heritage restrictions, resulting in additional design and construction costs. “Council has been negotiating with the State Government over the last two years on an appropriate replacement for the Parramatta War Memorial Swimming Pool. At the 8 October Council meeting the elected Council resolved that the State Government should fully fund the replacement pool in line with the NSW Parliamentary Committee’s inquiry and report into the Sydney stadiums strategy, which recommended that the NSW Government fully fund the design and construction of a replacement pool as a matter of priority.